One of Kentucky’s most notable distillers will be hanging up his copper thief this September after spending 49 years of his life to support the same distillery. 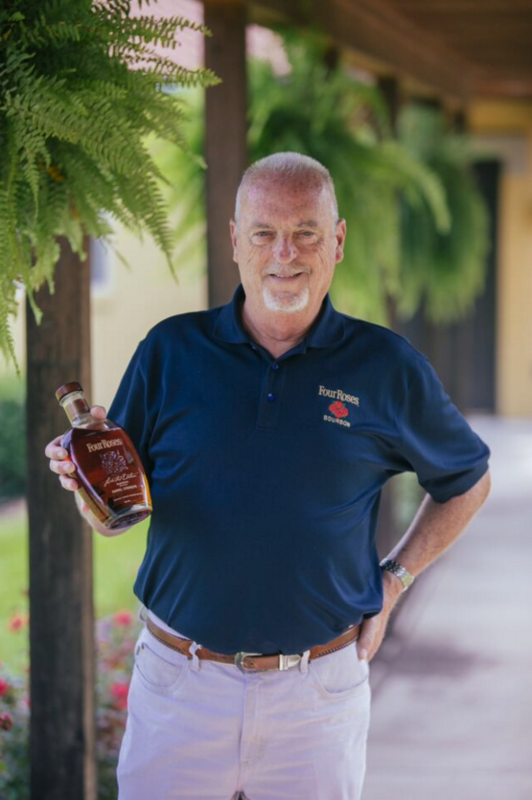 Jim Rutledge will be remembered as one of best distillers of a generation loaded with Bourbon Hall-of-Famers. Rutledge seemed to be born with a DNA that was specifically structured for hard work, hard-headiness and forging the courage to always speak his personal opinion. He used all of those traits to save one of the most historical Bourbon brands from extinction. The stint in R&D didn’t last long and Rutledge was asked to work in one of Seagram’s five Kentucky distilleries. “I ended up working in just about every area of production,” Rutledge recalls. 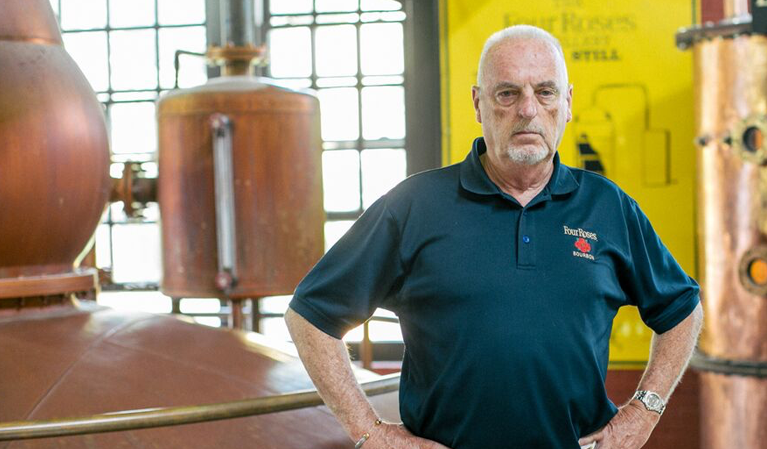 Rutledge learned every aspect of what it took to run a distillery. It was gratifying work for Rutledge who loved the early years he was involved with distillery production. But he had other talents that did not go unnoticed and the brass at Seagram decided to transfer him out of the distillery and into a larger corporate role. During the winter of 1975, Seagram asked Rutledge to transfer to New York City, home of their corporate headquarters. Not thrilled, Rutledge did move to New York to take over the title of chief industrial engineer for Seagram’s U.S. distilleries. When Rutledge started at Seagram’s they were operating five distilleries in Kentucky. But the declining interest in Bourbon caused many companies, including Seagram’s, to consolidate operations and close non-profitable distilleries. When he moved to New York City in 1975, Seagram’s had only five distilleries running in North America total. There were down to two in Baltimore, one in Indiana and one in Kentucky. A decade later, the task of long-range distillery planning and budgeting for Seagram’s U.S. distilleries was added to Rutledge’s workload. Early in his tenure at this position he noticed that their barrel inventory for foreign markets could not come close to meeting supply. Four Roses gained a presence in the Japanese and European markets after Seagram’s purchased the brand in 1943. Eventually, Seagram’s decided to pull Four Roses Bourbon from the U.S. and replace it with a cheap blended whiskey under the same name and only sell the Bourbon in its foreign markets. But a year later Seagram’s moved their production headquarters from NYC to White Plains, NY where Rutledge’s commute time shorted from four hours to about an hour. He started to believe if he didn’t get directly involved with distillery operations then he could at least manage with the shorter commute now. As fate had it, in 1990 his direct supervisor asked him if he’d actually been serious about wanting to get back into distillery operations. He told Rutledge he was retiring soon, but promised he would do whatever he could to get him back into distillery operations if that’s what he really wanted. Rutledge confirmed he’d prefer to take another shot at working inside a distillery. In 1992, Rutledge got his wish and was transferred back to Kentucky at the Four Roses Distillery. His bosses wanted him to start working at the distillery immediately, but Rutledge actually fought the idea because he didn’t feel comfortable jumping into the head leadership role with such a long absence in production. He wound up starting out at their warehousing center at Cox Creek and ran that along with most of the administrative and forecasting duties for the distillery. 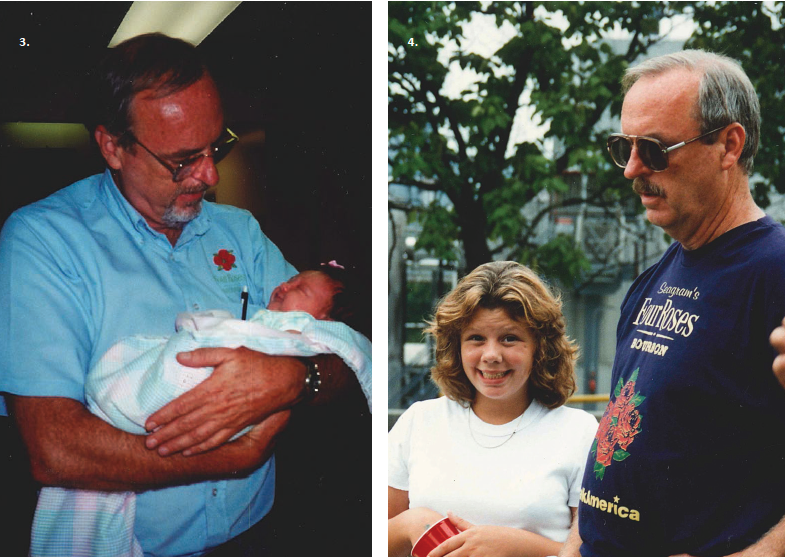 (Left) Jim holding one of the distillery worker’s infant daughters. 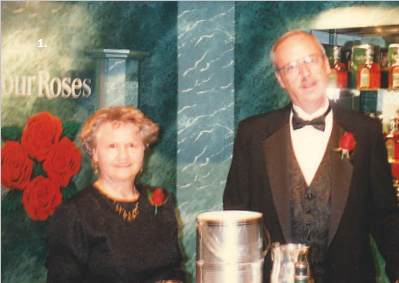 (Right) Cindy Rutledge and Jim at Four Roses summer picnic August 1994.
distillery. The executive shared with Rutledge that they needed him to come back to New York during September and October of that year to help them perform his old job of completing the industrial budgeting for the following year. He assured Rutledge that he could go back to Kentucky, but they were ready for him to start running the distillery. That executive also shared with him that the quality of the alcohol that they had been distilling over the last three years, was so substandard that if it didn’t improve dramatically before the summer shut down, a common practice in distilling, that they would close the distillery for good. This was shared with Rutledge and no one else at the distillery. 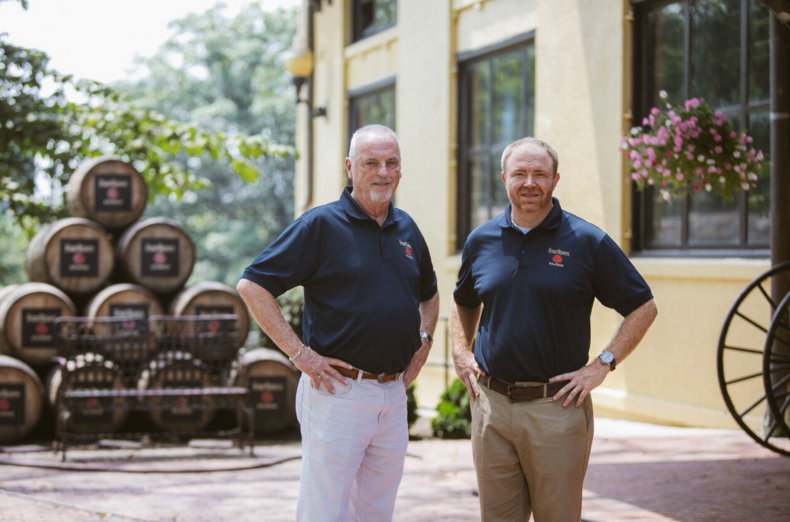 It didn’t take Rutledge long to discover one of the major reasons the Four Roses Distillery was producing low quality distillate. According to Rutledge, he noticed several supervisors not practicing a consistent process during distilling. From that point on Rutledge’s distillate averaged a 3.4 rating until the deadline of the summer shut down finally arrived in mid June. It was time for the Seagram to make their decision on to keep the distillery open or shut it down. It seemed the 16 hour work days and the phone calls during those weeks to get out of bed when something wasn’t working, paid off during those his first six months as head of the distillery. After Rutledge got the Kentucky distillery back on track and saved it from closure, he started lobbying Seagram’s to start selling Bourbon in the United States again since all of it was going to foreign markets. Right before Rutledge came back to run the Kentucky distillery, he had introduced the idea to his superiors at Seagram’s to quit making the Four Roses blended whiskey and return the straight Bourbon back to the U.S., just like it was during the 30’s, 40’s and 50’s when it was the number one Bourbon in America. Anytime Rutledge spoke to his superiors back in New York he would always ask them, “When are we going to stop making this rot-gut whiskey and bring our Bourbon back to the U.S. market?” They would reason not bringing it back with several excuses but the biggest was that Seagram’s was not willing to spend millions of dollars on a brand to correct a mistake it had make almost a half century ago. It took Seagram’s getting out of the alcohol business in 2001 to make Rutledge’s dream come true when their distributor in the Japanese market, Kirin Brewing purchased the Four Roses brand and the Kentucky distillery. Rutledge only had the barrel inventory to launch in one market so they chose Kentucky as the first market to release the newly branded Four Roses Single Barrel in September of 2004. It quickly became the best-selling single barrel Bourbon in Kentucky according to him. It was shortly after this launch that Rutledge started lobbying to increase production so more Bourbon was put back for the future. He says his cries fell on deaf ears as modest increases were chosen over a more aggressive growth potential. But who could really blame Kirin as it appears no Bourbon company predicted the insane growth Bourbon has seen over the last half decade. In 2011, Four Roses sales numbers grew 42%. That insane one-year growth even surprised Rutledge who thought to himself, “This will never happen again.” The next year in 2012, they were up 58% compared to the previous year. In 2013 and 2014 they were up 71% and 78% respectively. Rutledge admits that there is a barrel inventory shortage at the moment to continue their growth pattern, but compared to the problem of just keeping their stills operating 20 years ago it’s a problem he prefers leaving as part of his legacy. Rutledge firmly believes aging Bourbon inside of a barrel after the natural sugars have dissolved is counterproductive. He does admit that sometimes those sugars do last 15 to 20 years in barrels and when that happens, “There’s nothing better.” But his 49 years in the industry lead him to believe that most of those sugars stay in the barrel for no longer than nine years. Rutledge feels some of the companies that market flavored Bourbon along with whiskies that used to be Bourbon but have been changed through a second barreling process are riding the coattails of Bourbon’s heritage. He even believes it’s possibly misleading consumers into believing what they’re drinking is Bourbon, when in some cases it’s not. Rutledge’s duties to Brent Elliot. He has been with Four Roses for 10 years and according to Rutledge is qualified to handle the production duties. This doesn’t mean Rutledge is leaving without any worries of what challenges lay ahead for the company he has given the majority of his live to. Rutledge confesses, “The focus [of Four Roses] can never be quantity versus quality. That is what got the distillery in a mess to begin with. We’re putting some emphasis on expanding but I hope we stick with what I’ve said from the beginning which is if we’re not producing quality Bourbon then we don’t need to be putting a gallon in a barrel. 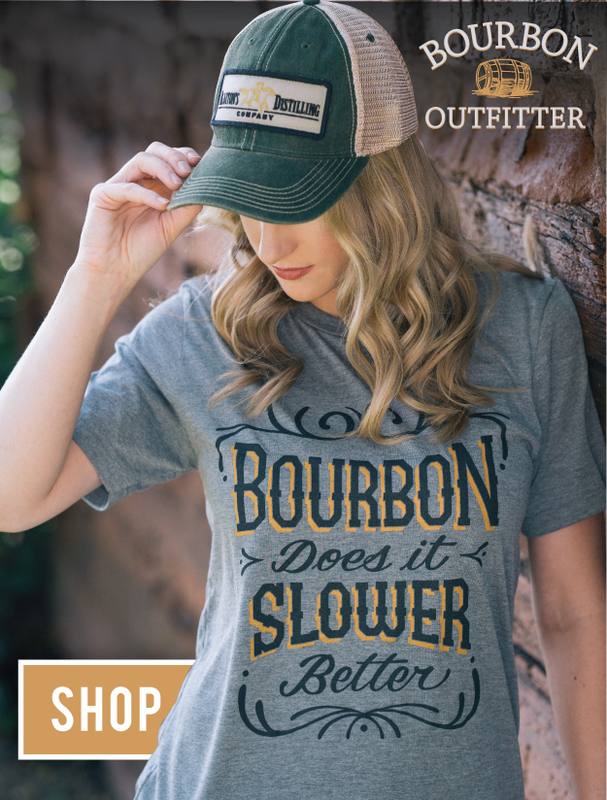 We don’t have to change anything (on how the Bourbon is made) we just got to sustain what we’re doing. The focus has to be on quality and there will be no downsides.